Editor’s note: The Trump administration on Tuesday announced it will end DACA in six months. At age 21, Alex Trujillo has accomplished a lot in life. He’s an SOS Outreach graduate and former SOS Sherpa who mentored other at-risk kids, and he’s a graduate of both Battle Mountain High School in Edwards and Colorado Mesa University in Grand Junction. In a labor-starved tourism economy like Eagle County’s, Trujillo seemingly has everything you’d want in an employee – except citizenship. Trujillo’s parents brought him to Eagle County from the Mexican border state of Chihuahua when he was just five years old. They were looking for work and a better life, but Trujillo had little say in the matter. Eleven years later, after attending Edwards Elementary School and Berry Creek Middle School, Trujillo realized he was different from his friends at Battle Mountain. But two things changed for him starting in 2012 when then President Barack Obama signed an executive order implementing the Deferred Action for Childhood Arrivals (DACA) program. First, Trujillo would be able to obtain a two-year work authorization under DACA that allowed him to legally work and study in the United States as long as he stayed out of trouble with the law. Second, he became eligible for in-state tuition at Colorado colleges when Vail’s own former state Sen. Mike Johnston sponsored and helped pass the Colorado ASSET law in 2013. When he turned 18 in 2014, DACA card in hand, Trujillo was able to work his way through college at Colorado Mesa, earning a degree in kinesiology with a minor in business administration. He felt secure from possible deportation to a country where he was born but has never returned, and happy to be contributing to the well-being of his family and community. Then last year, everything changed again. Trujillo’s two-year DACA registration, which includes being fingerprinted and regularly checking in with federal immigration officials, expired. And President Donald Trump, running on an anti-immigration platform that included a promise to repeal DACA, won the White House in November. Trujillo’s senior year at Mesa was a very nervous time for him. He wasn’t able to renew his driver’s license or work legally because his DACA authorization had expired, so he stayed close to home near campus, not going out much with friends in Grand Junction and basically keeping a low profile. He was even afraid to come home to the Vail Valley on break. “There was some fear,” Trujillo acknowledged, as rumors swirled about Immigration and Customs Enforcement (ICE) agents cracking down in Eagle County and across Colorado, even snapping up low-level criminal offenders at courthouses locally and around the nation, including a few DACA recipients. 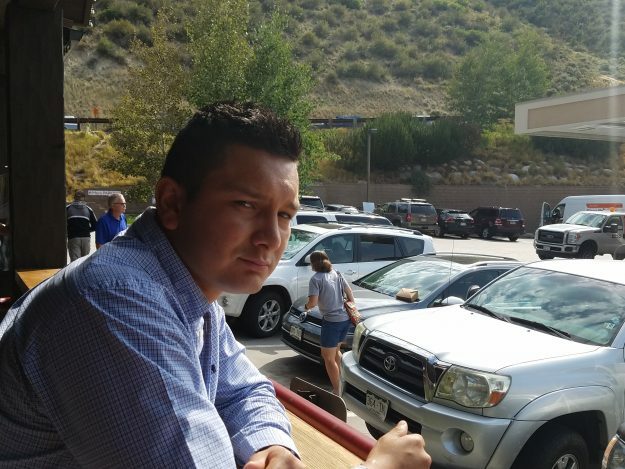 After several tense months, Trujillo was recently able to renew his DACA application for another two years – this time under the Trump administration – and he’s back home in Eagle County and working legally for an Edwards-area restaurant. Talking exclusively to RealVail.com, Trujillo is not at all discouraged by his experiences. He doesn’t talk about fairness or political uncertainty. He understands he’s not a citizen and therefore has to adhere to everything the government wants him to do, including avoiding any legal trouble whatsoever. And he knew delays would occur during the political transition. “It took me this time a little more time to get [DACA], and I understood because there’s a new president coming in, but I finally received it, so now I’m able to just work legally again and that’s really good,” Trujillo said. Trump has backed off his campaign promise to repeal DACA since winning the White House, saying he would “show great heart” in dealing with DACA recipients. There are more than 750,000 people in the program nationally, including nearly 18,000 in Colorado and nearly 200,000 renewals since Trump’s inauguration in January. But now a group of 10 Republican attorney generals (not Cynthia Coffman in Colorado) and the governor of Idaho have given the administration until Sept. 5 to repeal DACA or face the legal consequences. Some Trump administration officials have questioned the constitutionality of DACA, leading observers to believe the Justice Department won’t defend the program. Pete Boogaard, currently a spokesman for the tech-industry immigration reform lobbying group FWD.us, previously worked for four years in communications at the Department of Homeland Security. His job was implementing the DACA program for the Obama administration under former DHS Secretary Janet Napolitano. Boogaard is concerned that anti-DACA sentiments from U.S. Attorney General Jeff Sessions and former DHS Secretary and current White House Chief of Staff John Kelly mean the administration, despite Trump’s promise of compassion, won’t defend DACA in court. FWD.us and other immigration advocacy groups are hoping for a legislative solution such as the bipartisan Dream Act or the RAC (Recognizing America’s Children) Act, which is co-sponsored by Colorado Republican Mike Coffman and 18 other Republicans. U.S. Rep. Scott Tipton, who represents Colorado’s Western Slope, is not one of those GOP co-sponsors. A spokeswoman for Tipton this week did not respond to a request for the congressman’s stance on the state attorney generals’ challenge of DACA and the looming Sept. 5 deadline, but in the past Tipton questioned the program’s constitutionality. “Instead of acting unilaterally, [Obama] should have worked with Congress to enact real immigration reforms to provide options for children who had no say in being brought to the United States at a young age,” Tipton said, adding he hoped for a “compassionate and sensible” legislative solution in the current Congress. Various iterations of the Dream Act, introduced last month in the Senate by Republican Lindsey Graham and cosponsored by two other Republicans and five Democrats (none from Colorado), have been unsuccessfully introduced dating back to 2001. The current Congress appears just as gridlocked on immigration reform, but Trujillo remains hopeful. And he hopes that someday citizenship could lead him back to his birthplace to visit family, as the DACA program only allows for emergency trips back to Mexico. “I would love to go, and I would love to see some family and stuff, but I’ve lived here for a long time too, and I want to wait until I actually get my citizenship so I can go there and visit and be able to come back with no excuse of just going there for an emergency,” Trujillo said.